This is one of the budget choices we included on our list. Despite its lower price, the APEC ROES-50 5-Stage is a very efficient reverse osmosis water filtering system. In the following article, we review this filtration system revealing the pros and cons of using it. We also take a closer look at its efficiency, filters, and the installation process. The APEC Top Tier 5 Step is designed and assembled in the USA, so you can rest assured that the filtered water will pass the harshest standards, providing a guarantee that the water is safe to drink and good for your health. This reverse osmosis system uses a 5-step filtering process. The filters are easy to change, and changing them can be done without using any tools. The APEC Top Tier uses great filters, and they will remove up to 99% of the contaminants usually found in the water, including fluoride, chlorine, copper, lead, heavy metals, bacteria, and viruses. The RO water filter also comes with a chrome faucet. While the faucet doesn’t have a great appearance, it’s serviceable and it actually works better than expected. This reverse osmosis filter has a wastewater pure water ratio of 3:1, so it’s generally considered efficient. While you might believe that wasting 3 gallons of water is not efficient for a water filter, keep in mind that other models waste up to 20 gallons or more to produce the same amount of water. As far as RO systems go, if the ratio is smaller or equal to 4:1, the unit is considered efficient. With a 3:1 ratio, this unit is an above average efficient system. Using an efficient RO filter is not only good for the environment because you waste less water, but it’s also cheaper in the long run. 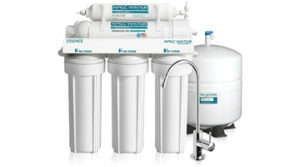 The APEC Top Tier 5 Step reverse osmosis water filtering system uses 5 filters to produce clean water. The water filters are very efficient, and they remove up to 99% of the contaminants usually found in the water. They are designed to treat both well water and tap water. The filters are easy to change, and a full set of filters is rather cheap. The fourth filter is the reverse osmosis membrane. The membrane will only allow particles smaller than .0001 microns to remain in the water, so you can rest assured that most of the contaminants will be flushed out, including pharmaceutical drugs and hormones. The filters have to be changed once every 6 – 12 months of continuous use, depending on the water source, and the reverse osmosis membrane can be changed once every 2 – 3 years. Changing the reverse osmosis membrane is more expensive than changing a full set of normal filters, but that’s to be expected, as this is the most important component in the whole filter. The APEC Top Tier 5 Step comes with all the necessary components for the installation. However, you should have a drill, a Phillips screwdriver, and an adjustable wrench close at hand when you begin the installation. You might have to use the drill to make a hole in your counter, so you can install the faucet. You will also need a 1/2” bit. Keep in mind that if you want to drill into a marble or granite counter, you will have to buy a diamond tip saw a bit before you start. Once you have the hole in the sink/counter, you can begin the installation. This part is rather easy, and anybody with some DIY skills will most likely be able to install the unit in under one hour. If you don’t really have experience doing things on your own, don’t worry. The instructions are well done, and they will guide you step-by-step through the installation. If you’re not certain of something, or you think you’re stuck, check out the video tutorials online. They can be most helpful. You should also keep in mind that once the unit is installed, you will be able to use it for at least 6 months without having to change anything, so take your time. If you install the unit properly, there won’t be any leaks or other problems. Extra Filters – This reverse osmosis system comes with extra filters, so you can use it for up to 12 months and change the existing filters without additional costs. Long Lasting Filters – Only 3 out of the 5 filters have to be changed once or twice every year. The other two can be changed once every 2 – 3 years. Easy Installation – This unit is really easy to install, even if you don’t have any previous experience. The instructions are really helpful, and the video tutorials help if you get stuck. Long Filling Time – The water tank takes a lot of time to fill once it’s empty. Is this a pressurized system? I intend to use a passive input and need to know if this unit will function without city water pressures.